Music festival bags are extremely important, especially in the summer when one could get seriously dehydrated. 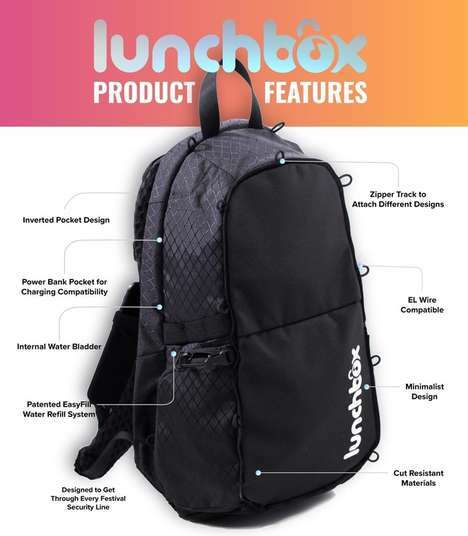 The Lunchbox offers a feasible solution for those who are looking to carry their possessions in a seamless and secure manner. Funded on Kickstarter, the “amazing pack” features a strategically reinforced silhouette that is resistant to abrasions, as well as unauthorized tampering. Foreseeing that events of such nature can be extremely exhausting, the developers of the music festival bag have equipped it with a water pouch that can be efficiently refilled and easily accessed. In addition, the pockets of the Lunchbox face inward, making it impossible to open the bag without having it off. Taking into consideration the style-minded consumer, the accessory also features graphic skin panels, as well as an integrated EL wire that lights up in different colors.